Quick getaways are always fun. But with a limited amount of time for fun, you either need to already know the area you plan to visit, or do a bit of advance research so that you get the most out of your short trip. This time I wanted to go somewhere I hadn’t been before and I chose Las Vegas. Las Vegas is the epitome of capitalism at work and if you don’t do a bit of research, you’ll spend more money than you’ll need to and also not get as much for the money that you do spend. The Internet is the best place to begin researching your destination. There are always websites dedicated to giving tips on saving money, things to avoid or do, and many times even getting things for free. I like FREE! Las Vegas is the perfect destination where advance research pays off. Otherwise, dollars will be slipping through your fingers left and right. Getting the best travel and accommodations for the best price is essential and is your first task. I recommend using the online travel sites such as Orbitz.com and TripAdvisor. TripAdvisor is great for getting information on the hotels offered in Orbitz’s packages that include airfare. TripAdvisor not only gives you hotel descriptions but also customer reviews (many of which I take with a grain of salt). Using Orbitz, the cost for my hotel/airfare package staying at the Bellagio was about $500 per person. The package included two free tickets to see Cirque du Soleil’s KÀ at the MGM Grand Hotel and Casino. Each free ticket was a $139.00 value and to top that, we were given seats in the third row so we saw all the action up close. 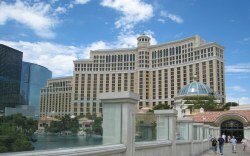 We chose the Bellagio because it was centrally located. Second, the rooms are beautiful and spacious. And finally, with the package price, we felt it was the best value. Other hotel packages were only a little bit cheaper and we figured with the small price difference, just go five-star. You should also know that when selecting a hotel, the room rates increase dramatically on weekends, sometimes by as much as triple ($399 a night and up). If you don’t absolutely have to be in Vegas on the weekend, you’ll find the prices dramatically lower during the week. Before the trip, we spent a good bit of time researching the restaurants. From experience, I know that when you stay in a five-star hotel, they usually have five-star prices. I also knew that some of the smaller casinos off the strip like Ellis Island Casino and Brewery have meal specials to entice visitors to go to their establishments. It is a good idea to make a list of possible places you might want to check out. Include the address, type of meal and the time the meal is offered. Carry the list with you for easy reference. For example, some places offer a steak and egg breakfast but only from 11pm until 8am. It is also a good idea to research the casinos themselves. Some casinos have greater payouts or offer better player odds than others. Some casinos are upscale and elaborate while others are shabby dives that are visually unappealing all together. If you do as we did and “casino hop” (which I recommend if you’re a first-timer), you’ll also find that some cater to children such as Circus Circus, some cater to the young adult crowd like Luxor and others may cater to those of more distinguishing tastes such as the Bellagio or Wynn. Choose a place that fits your style and it’ll make the time spent gambling all the more enjoyable… especially if you win. Arriving at the Las Vegas airport is a pleasant experience with its contemporary design, cleanliness, and I must say, quietness. On a short trip such as ours, we avoided having to pay for checked bags by only taking the roller carry-on bags. By doing this you also avoid having to wait for your bags upon arrival and you can get to the taxi stand before the rest of those on your flight. There is a taxi stand just outside the front door. And let me tell you that if you visit in the summer the incredible blast of heat that hits you when you exit the airport is one that you can’t prepare for. I can honestly say that I’ve never felt 104° Fahrenheit before and I would compare it to a hairdryer blowing in your face on a hot summer day. Other avenues of transportation available are shuttle busses and limousines. When taking a taxi, you should know that there are two ways of getting to The Strip. One is by the highway and the other is by Paradise Road. Depending on which end of the strip you stay on would influence the way you’d want to go. If you stay near the Luxor, you might want to take the highway but if you are on the opposite end, Paradise Road might be a better and/or cheaper option depending on traffic and time of day. In either case, the cost of the cab to the strip should range from $20 to $35 but remember they don’t have flat rate charges so with heavy traffic the price could go higher. Arriving at the Bellagio is an experience in and of itself if you have never been to Las Vegas. Water fountains frame the entrance, made even more beautiful by the flower gardens around them. The hotel foyer is quite massive and looking up at the ceiling inside you’ll see the beautiful glass sculpture of 2,000 dynamic hand-blown glass flowers by world-renowned artist, Dale Chihuly. Of course the hotel’s signature is the dancing fountains out front that have shows beginning around noon until midnight. Checking in was a breeze for us (but be warned, at other times of the day when we passed through, the lobby resembled a human zoo). The Bellagio is humongous so our room was a 5-minute hike to get to from the reception desk. The hotel has a multitude of restaurants including a café, gelataria, and buffet. You can also eat by one of the five pools or just stroll around the indoor botanical garden that includes a brightly colored 1920’s era Ferris wheel. The posh, gargantuan casino makes up the rest of the main floor, with a connecting hallway to Bellagio’s shopping mall, a collection of upscale designer boutiques; the likes you would see in Bal Harbor or South Beach. Our room was spacious and beautiful. Arriving early we got one with two queen beds instead of a king size bed as it was the only type of room available. The room overlooked the dancing fountains out front that gave beautiful shows throughout the afternoon and evening. I could recommend this upgraded view to anyone. It was just beautiful. The room had a television, clock radio with I-Pod hookup, guest robes and slippers, marble bathroom with shower and soaking tub and best of all, a double-sink vanity. The drapes weren’t the only thing electronically controlled. The mini bar was ultra-sensitive. If you remove anything from the mini bar (or in some cases, just bump into it too hard), it electronically notes it and charges you for it; even if you put the item back. There are three main ways to get around in Vegas – “The Deuce”, taxi or monorail. We found taxis and the monorail to be most convenient. The monorail runs from the Las Vegas Hilton down to the MGM Grand Hotel. The monorail is $13 per person for a 24-hour pass. This can be much cheaper than taking a cab, especially if the traffic is heavy or there is construction. The monorail is more convenient if you’re staying on the east side of The Strip. 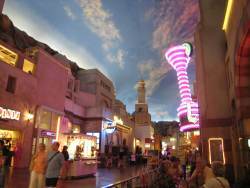 For other hotels, it can involve some pretty lengthy walks across Las Vegas Boulevard and through huge hotel lobbies and casinos. There may be times when you just don’t want to walk to the monorail stations because of the heat or you’re just exhausted, so using a taxi is the next best thing. 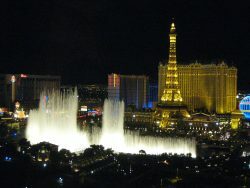 Going from the Bellagio to the Luxor is about a $15 cab ride on The Strip and about $10 taking the highway or back roads. The Luxor, Excalibur, and Mandalay Bay have a tram that will take you between each. When catching a taxi, you must get one at a taxi stand or at a hotel taxi stand since it is against the law for a taxi to stop on a street. This means that if you’re on The Strip and are trying to flag down a taxi, you’ll be there a long time. Many times a taxi can pull in to a driveway and pick you up. Finally, when catching a cab, it’s useful to know in advance generally where you’re heading and how you want to go. We never had a problem with a driver trying to take us “the long way around”, since we sounded like we knew exactly where we were going and how we wanted to get there. In fact, many drivers gave us the option of choosing between “traffic and view”, or back roads (“faster and cheaper”). Like a cruise ship in so many ways, Las Vegas offers many activities for young and old. Spas, pools, hotels with various themes such as the Luxor’s pyramid or Excalibur’s castle or even Treasure Island’s pirate boat out front. Some, like Circus Circus, offer indoor theme parks and circus shows or even New York New York’s outdoor coaster. There are hundreds of nightclubs, all vying for your wallet. There are plenty of day trips you can take to the Hoover Dam or the Grand Canyon. But the activity that generates the most attention are the numerous A-list shows featuring stars such as Cher, Bette Midler, Cirque de Soleil, comedians, magicians, and dinner theaters. And of course there are the casinos. Our package came with free tickets to Cirque du Soliel’s KÀ and what a show it was. As the website describes it, “KÀ, the unprecedented, gravity-defying production by Cirque du Soleil takes adventure to an all new level.” And it did go to a new level, multiple levels. And sitting in our FREE third-row seats made it even better. Even if we had to pay, KÀ would have been well worth the money spent. If you do go for a package that includes a free ticket to a show, you must go to the box office and get your tickets in advance. I strongly recommend reserving your tickets as soon as possible and then getting to the box office when it opens to insure you get the best seats. Some seats are provided as a pre-paid discount voucher with no reserved seat number. The later you wait, the worse your seats will be, as each class of seats is allocated on a first-come, first-served basis. Money saving tip – skip the $15 frozen drinks at the concession and just get a regular drink. Although tasty and large, there’s very little alcohol in them. The second show we checked out was Chris Angel’s Believe. This was a spur of the moment decision, so we checked out one of the many outlets that sell ‘’day of” tickets that haven’t sold at the box office. We went to the Fashion Show Mall where we knew one such booth existed. However when we arrived, we realized many, many others knew of it too. While one of us waited in the long line outside in the 100-degree heat, the other went upstairs to eat at the food court. Low and behold, another company, Las Vegas Half Price Tickets, had a ticket booth with no line at all. A quick call downstairs confirmed both places were offering tickets at the same price. In mere minutes we had our $135 tickets for $87. When you buy tickets this way you will get a ticket voucher, and so you must go directly to the show’s box office to get the best seats, which is what we did. Now, I like Chris Angel and his television program on A&E Network, however even with Cirque du Soleil’s production added in this show, it was quite a letdown. Specifically, the magic was just remedial. Although overall it was a fun time (and a show for adults, if you’ve got kids, take them elsewhere), even at the discount price, I recommend a full on Cirque de Soleil show instead. This will be short. Why? Because there are just too many places to eat. I will however tell you a couple of places that we ate that we found to be fine or better. The first night, still on Eastern Time and pretty hungry by 7 PM Vegas time, we walked across the street to the Miracle Mile Shops at Planet Hollywood. Miracle Mile Shops is an indoor mall where we ate at Lombardi’s Romagna Mia which had reasonable prices for good Italian food, around $10-$15 per plate. The next morning, we had a nice breakfast of scrambled eggs, sausage or bacon, and home fries for $3.95 each at la Salsa Cantina just across from Lombardi’s. If you are a breakfast type of person, you should know that after 11am you’ll be eating lunch, unless you want to wait in the long lines at either one of the two Denny’s in town. Twice we had lunch at the food court at the Fashion Show Mall because prices at the restaurants in the hotels are a bit expensive. Also, with the Las Vegas summer heat, it is difficult to really enjoy eating. Las Vegas does have world-class restaurants if you so desire. Many of the United States’ best chefs such as Wolfgang Puck and Todd English have restaurants there. While you can spend entire days in Vegas and never touch a slot machine or get in on the non-stop action at one of the gaming tables, let’s be realistic. We’re in Las Vegas and we’re going to gamble. I won’t go on about which are the best games, what strategy you should use or which casinos are better than others. The casinos are nothing more than giant piggy banks for the resorts, and if you play for long enough, you will lose. It is up to each individual to determine his or her tolerable level of losses. That said; here are a couple of tips that might save you some cash when hitting the gaming tables. Join the casino “Players’ Club”. Almost every casino has some version of a players’ clubs. You enroll in the casino and after they verify your identity, you’ll get a plastic card. Once you get the card, use it every time you play slots or gamble at the tables. As you play, you gain points that you can redeem during your stay for free play, meal discounts, hats, t-shirts, etc. If you play table games like Blackjack, roulette or craps, buy in (trade your cash for chips) with as much cash as you can afford, even if you don’t plan on gambling all of it away. For example, it’s better to buy $100 of chips than to buy $20 at a time. When you buy in, always present your players’ club card to the dealer or pit boss. They will rate your play and if you’re at the table long enough and/or bet enough, you may find that you’re offered free trips to the buffet, free tickets to shows, etc. I saw one woman at the Pai Gow Poker table with me ask for, and get, four free passes to the Bellagio buffet after about 45 minutes of play (although she was betting a lot each hand). On the last evening of your stay, if you’ve been gambling more than a few hours each day, pay a visit to the casino office. Speak to one of the casino hosts there and ask if you’re entitled to any “comps” (free stuff) based upon your level of play. If you have something specific you’re looking for, don’t be afraid to ask, as long as the request is reasonable. For example, if you’re not a “high roller”, don’t expect to be comp’ed your entire hotel bill. I went to the casino office and the host credited me back a half-day of my room charges and the meals I had charged to my room (in total about $300). The basic rule; if you’d like something, ask. If the request is reasonable, you will probably get it. If not, the worst they can say is “no”. We loved the Bellagio and found the staff to be extra nice and helpful with any questions we had – and we did have some. I recommend you to ask your questions, use the free gambling classes that nearly all casinos offer. Have a “love night” where you eat well and sip wine or champagne while watching the dancing fountains. This is one place were nearly everyone walks around with a smile (unless it’s 104 degrees out and it is me) and looks as though they are enjoying themselves. You should casino-hop to see the many different hotels and hotel themes. The weather can be unimaginably hot, especially in the summer. The temperature ranged between 99° to 104° the four days we were there. And don’t let anyone tell you that “well, it’s a dry heat…” – HOT is HOT. Yes there is a difference between Miami’s 90 and Las Vegas’, but at 100+ it is uncomfortable anywhere. With all of its amenities I would expect more gays and lesbians visiting Las Vegas. It has everything they could ask for. It has beautiful hotels, Bette and Cher (the real ones), nightclubs, and alcohol with plenty of places to shop and eat. We look forward to our next trip and hope to bring friends to this “adult Disney Land” that, with the exception of the beaches here could be considered “sister” cities.